Lumbar spondylolisthesis is the most common location for vertebral slippage to occur. The usual location is L5, but L4 is another typically affected vertebra and listhesis can theoretically occur at any of the lumbar vertebral bones in less common scenarios. The lumbar spine is disposed towards developing listhesis for several distinct reasons, some of which are universal and others are case-specific explanations that vary from patient to patient. It should be no surprise that the lumbar region is the most frequent site for listhesis, as it is the spinal zone which experiences the most degeneration at the youngest age compared to the other sections of the vertebral column. Additionally, the lumbar spine tends to feature particular congenital irregularities that cause or contribute to the development of listhesis immediately or later in life. This discussion focuses on spondylolisthesis in the lower back. We will discuss why listhesis tends to favor the lumbar spinal zone and also provide some basic facts to help patients better understand the anatomy of the lower backbone. Spondylolisthesis tends to favor L5 as its preferred vertebral level. L4 accounts for the second largest number of cases, with all the other lumbar bones accounting for a much smaller number, even when combined together. L5 is the final individual vertebral bone in a typical anatomy (since transitional vertebrae are atypical and are named L6). What is it about L5 that makes it so susceptible to the development of listhesis? We know that L5 is perhaps the very first vertebral bone to show marked degeneration earliest in life, including facet joint deterioration and general arthritic accumulations. Spinal stenosis will often begin its formation here, as well. The discs which surround the L5 vertebra, including L4/L5 on top and especially L5/S1 on bottom, are those which desiccate the quickest and most severely in the entire backbone. Similarly, these discs are the ones which most often bulge, herniate and/or rupture. Lumbar hypolordosis and hyperlordosis are very commonly seen at L4 and L5. Lumbar scoliosis affects a reasonable percentage of the population, as well. Why are all these abnormalities concentrated into such as a small and seemingly very troublesome anatomical area? When it comes to congenital spondylolisthesis, the lumbar spine is a common area for a fetus to express structural aberration, often linked genetically to previous generations within the family line. Spina bifida generally occurs in the lower lumbar spine, as does congenital spinal curvature issues, such as lumbar, thoracolumbar and cervicothoracolumbar scoliosis. Transitional vertebral bones and sacralization universally occur at the traditional lumbosacral juncture and wedge-shaped vertebral bones tend to occur in the lower lumbar region, as well. Pars interarticularis abnormities, such as elongation and incomplete formation are most often seen at L4 and L5. When it comes to developed listhesis, the lumbar spine also figures prominently into the contributory circumstances of causation. As noted above, the low lumbar region degenerates the fastest and most significantly of all spinal locations. The lumbar spine is also the lowest in the anatomy and must bear the brunt of weight and stress not endured by the rib-reinforced thoracic levels or the cervical spine in the neck, which must only support the head. Injury to the low back is commonplace and can affect the structural integrity of the facet joints, pars interarticularis, spinal discs and even the supportive lumbar ligaments. All of these forms of trauma can contribute to the development of degenerative spondylolisthesis. There are reasons why listhesis is generally found in the lower lumbar spine. We have detailed the usual culprits in the sections above, but there are always exceptions to the rules. Listhesis can technically occur anywhere in the spine and can therefore scoff at the usual patterns of development on rare occasion. That being said, when discussing spondylolisthesis without additional details, most clinicians assume the condition to be anterolisthesis of the lumbar L5 vertebral bone. This is because the vast majority of cases fit this exact isthmic profile. 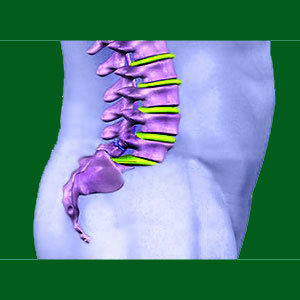 On an equally important note, the lumbar spine has a well-earned reputation as a problem area of the back. Most people fear lower back pain more than any other type of chronic health issue, due to its severity, ferocity and functional consequences. When low back pain exists in combination with listhesis, it is easy to blame the vertebral slippage for its occurrence. However, this assumption is incorrect in most instances, as supported by vast numbers of research studies that show spondylolisthesis to be mostly incidental to pain, particularly in its minor and moderate profiles (grade 1 and 2). Simply suffering pain in the lumbar spine tends to impart a significant nocebo effect, as people associate the region with chronic problems more often than not. It is vital to understand that although some cases of listhesis can be symptom-generating, these examples are the gross exceptions to the rule that account for less than 10% of all diagnosed cases. Therefore, in order to overcome the potentially catastrophic effects of the nocebo related to a positive spondylolisthesis diagnosis (grade 1 or 2) in the lumbar spine, we highly advise pursing knowledge therapy to help separate fact from fiction and help identify the true reasons for the pain, instead of pursuing care for a what may just amount to nothing more than a structural scapegoat.